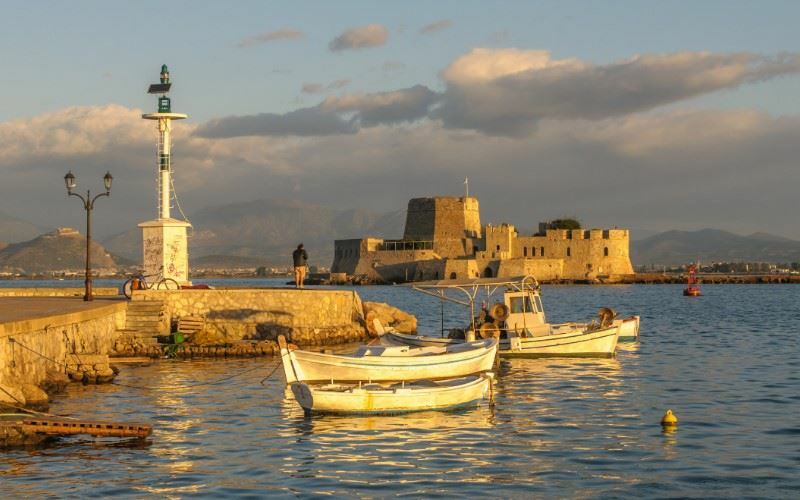 A short 1 week fly drive that enables you to explore this wonderful region from the scenic south to the historic north, staying in three of Greece's most atmospheric areas - Kardamili, a preserved village in the heart of Mani; the famous fortified medieval town of Monemvasia; and charming Nafplion, with its Venetian old town and castles. On arrival at Kalamata airport, collect your hire car and drive to Kalamitsi Hotel, tin the village of Kardamili, in the central Mani peninsula (c.1 hour). Overnight at the Kalamitsi Hotel. Days at leisure in Kardamili. The village was home for 50 years to the famous British travel writer and war hero Patrick Leigh Fermor. Today, the village continues to appeal to writers and artists as well as nature lovers and walkers. Today, drive from Kardamili to the Lakonia district of the Peloponnese, fondly known as the 'third finger' (c.2 1/2 hours). Your destination is the fortified rock of Monemvasia. Your overnight accommodation is the Goulas Guesthouse in Monemvasia (room only basis). Overnight at the Goulas Guesthouse. Free time in Monemvasia. Opportunity to take a stroll within the castle's walls and explore this historical town. From the 6th century town of Monemvasia, your holiday continues north to the first capital of Greece, Nafplion (c. 3 hours). Overnight at the Latini Hotel. Day at leisure in Nafplion. This elegant town is a delight to explore on foot; the narrow lanes of the old town are brimming with artist studios, galleries, restaurants and boutiques. After breakfast, drive to Kalamata airport for your return flight to the UK. The Kalamitsi Hotel is built above a beautiful bay about a mile south of Kardamili. The Kalamitsi Hotel is built above a beautiful bay about a mile south of Kardamili. It has natural surroundings and a long white pebble beach nearby. The hotel has been designed in a typical Maniot style. It comprises various stone buildings of one or two storeys dotted amongst the olive trees. The main building contains the BB rooms (double or twin). All have air conditioning, new modern shower room, TV (BBC World), fridge and wide covered balcony, with sea, country or mountain views. The rooms are spacious and beautifully furnished in local style. The studios are terraced within the grounds. They offer the same facilities plus a kitchenette (cooking rings, fridge) and have a veranda looking onto the olive grove. There is also a Family Suite comprising two rooms, a double bedroom and a living room containing two sofa-beds for children. The main building contains reception (safe facilities here) and has a lift. Evening meals can be taken on the front terrace and we have had good reports of the food here. A small path leads, via some 60 steps, to the beach (free towels provided). The Kalamitsi is a small and friendly hotel, and the family deserves credit for carefully preserving the natural surroundings here. A very peaceful location in a beautiful setting. The historic small town of Nafplion, recognised as one of the most beautiful in mainland Greece, has become increasingly fashionable in recent years. The historic small town of Nafplion, recognised as one of the most beautiful in mainland Greece, has become increasingly fashionable in recent years. So we are pleased to offer the Latini, which combines a prime location in the old town with good value for Nafplion. Renovated from an old townhouse, the Latini is just one street back from the harbour, where there is free parking. It overlooks a small square and is next door to a lovely Venetian church. Within a minute or two's walk you will find a wide choice of shops, restaurants and cafes. The eight rooms on the first and second floors are for couples only and accessed by a narrow staircase (please note there is no lift). Each room possesses twin or double bed, shower, small balcony, air conditioning, a hairdryer, TV and mini-fridge (except the single). A pair of interconnecting rooms offers good value for 3 adults or a family with two smaller children – please enquire. The third (top) floor houses the suite. Under the angled wooden ceiling, this cosy and very private unit is light, spacious and open plan. It has twin beds (can be a double), a sitting area with two sofa-beds for children, a full bathroom and an open roof balcony with sea and old town views. We must stress that the Latini is a no frills 'small and friendly' B&B in a very good central location. Breakfast is continental and the reception operates limited hours. It makes for a simple, comfortable and well priced base from which to explore all the delights of this beautiful old town. We have access to a range of higher category hotels which we are happy to price on request.